Optimize your home/office network with carrier class wireless routers from Brazos, one-time fee of $50.00. Contact our business office for details. An installation fee of $59 is required with all new Brazos Fiber Internet services. No phone line required. Brazos Fiber not available in all areas at this time. Contact us for more information regarding availability. Internet speeds are a best efforts service at an “up to” rate. Data rate speeds are not guaranteed and can be affected by network conditions. Internet rates are subject to change. Depending on the location of your Internet service in relation to our equipment some speeds may not be available. Price does not include applicable taxes. Resale of Internet service is not allowed. Additional IP addresses available on request-additional charges will apply. Call us Monday-Friday 8:00 a.m. – 5:00 p.m. 1.800.687.3222. Brazos Internet offers free technical support 24 hours a day, 7 days a week. Call our knowledgeable staff anytime at 1.800.687.3222 and we will be happy to help you. For after hours tech support call 940.564.8050 or 800.687.7996. When you sign up for Brazos Internet you automatically receive three (3) e-mail accounts. Additional accounts are $1.00 each. 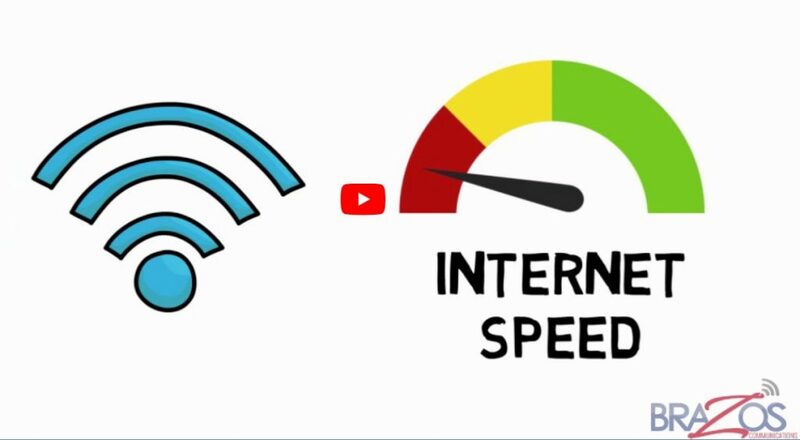 To learn more about the amount of information your connection can handle at a given time please click on the image below to watch an informative video about bandwidth. Optimize your home/office network with carrier class wireless routers from Brazos, one-time fee of $50.00. Contact our business office for details. An installation fee of $59 is required with all new Brazos Non-Fiber Internet services. No phone line required. Note: Depending on the location of your Internet service in relation to our equipment, some speeds may not be available. Non-Fiber Internet from Brazos uses traditional copper telephone lines to transmit and receive high-speed internet and voice at the same time. Internet speeds are a best efforts service at an “up to” rate. Data rate speeds are not guaranteed and can be affected by network conditions. Internet rates are subject to change. Depending on the location of your Internet service in relation to our equipment some speeds may not be available. Price does not include applicable fees/taxes. Resale of Internet service is not allowed. Additional IP addresses available on request-additional charges will apply. Call us Monday-Friday 8:00 a.m. – 5:00 p.m. 1.800.687.3222. If you have any questions about minimum requirements, please call our office at 1.800.687.3222. When you sign up for Brazos DSL you automatically receive three (3) e-mail accounts. Additional accounts are $1.00 each. You must have Adobe Reader to read this file.